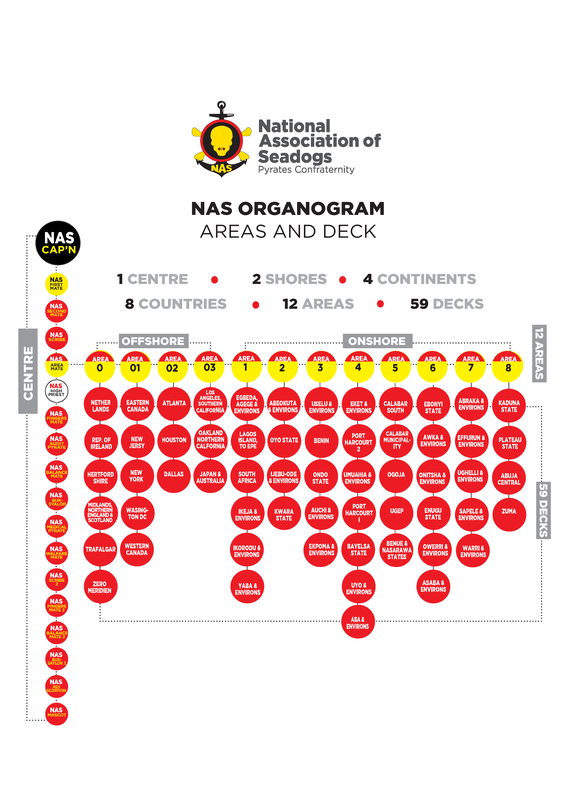 The maritime theme (inspired by Robert Louis Stevenson's classic ''Treasure Island'') is reflected in the organisational structure in which branches of NAS are referred to as Decks. They are known both by the town or city of location and an informal name such as 'Jolly Rogers 1'. The various decks are grouped into areas where necessary. The headquarters of NAS International, and NAS are in Nigeria. All decks have a number of officers who carry out the administrative and other functions. The highest office is that of the Captain or Capoon, and his deputy is the First Mate. Other officers fulfill the typical functions that such an organisation needs such as looking after finances, public relations, social activities and so forth. In addition, there is a central NAS executive which administers NAS and NAS International. The organisation is hierarchical and operates a strict discipline based on the understanding that the organisation has an altruistic mission which must be carried out. Members have to place personal convenience secondary to achieving the aims of the organisation and much stock is placed on members carrying out duties delegated to them. Failure to partake fully in organisational projects and discharge duties assigned can result in membership being suspended.